Patterson apartments with proposed rear new addition in a rendering from 2014. 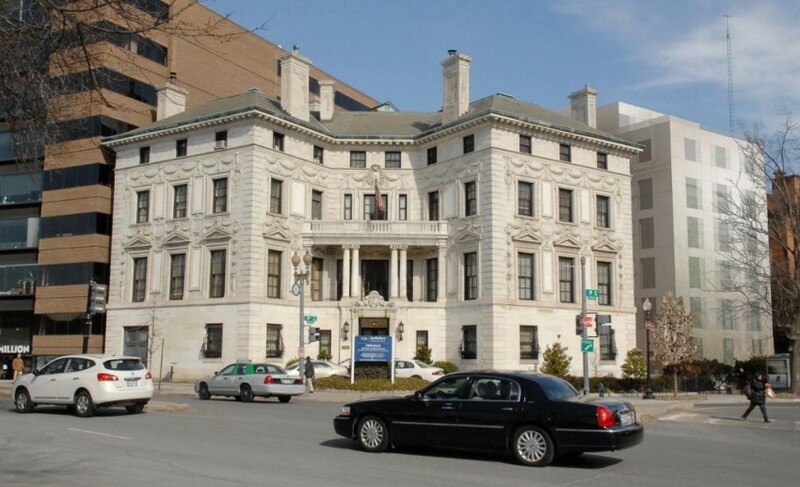 The conversion of a historic Dupont Circle mansion, the Patterson Mansion and former home of the Washington Club, should begin in the next month or so. The first stage of construction will result in the closure of P Street between 18th Street and Dupont Circle. I wanted to walk through the path before it closes for public use. This was my route for so many years. I was getting extremely emotional because while the newer projects were underway, this place would be cordoned off to the public. But I also realized how life teaches us that we need to work around our options. I soon found out a thoroughfare which was shorter than this route that I took every day. I would have never discovered the new route had I simply been going about the older one. See, a life lesson there! A similar incident I experienced during the 2008 recession. I was beginning to have a strong hunch that I may be losing out my job to the company’s downsizing of staff. I wanted to cry but I knew that if I broke down, my family would not be able to see. So, for their sake I put up a brave face. While I was working at office, I was also exploring the various possibilities that I could capitalise on incase the unfortunate happened. I hot upon automated trading robot randomly one day while I was searching for opportunities. Suddenly, it dawned upon me that I could try my hand at online trading if nothing else. The trading required a good connectivity, a device that connects via a telephone internet network and a small initial investment of $250 only. I never lost my job! But I did venture into trading online and do I have fun? You bet! SB-Urban plans to bring about 90 micro-units to the mansion at 15 Dupont Circle. The non-historic addition at the rear of the building will be demolished to make way for a new rear addition. Much of the historic structure’s interior will be retained and used as common space for future residents. The micro-apartments will come fully-furnished and allow leases as short as 3 months in length. The developers anticipate residents will consist of business travelers, visiting scholars and contractors in need of extended-stay apartments. Developer SB-Urban purchased the property in 2014 after garnering approval for its plans to build 92 micro-apartments between the historic structure and a new addition. The property sold by TTR Sotheby’s for $20 million and was the most expensive residential transaction in the city in 2014.